House Mouse The house mouse is one of the most troublesome and costly rodents in the United States. Unlike the cartoon character, house mice are anything but cute, causing damage and capable of transmitting pathogens than cause disease. Habits: House mice are good climbers, can jump twelve inches high, and eight feet down. They can easily squeeze through holes and gaps one quarter of an inch. They are very inquisitive about things in their environment, and readily explore anything new. Habitat: House mice are nibblers, feeding on food, preferring items like seeds and cereals. Their nibbling cause contamination of large quantities of food. They like to nest in dark secluded areas with little chance of disturbance, usually near an available food source. Nesting material includes such things as, paper, cardboard, insulation, and cotton. 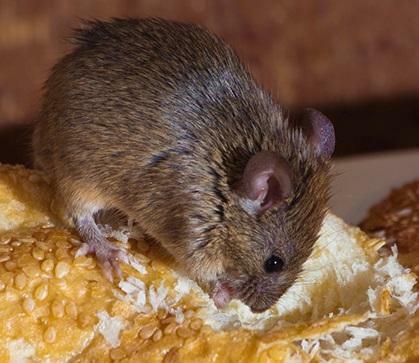 Threats: The major health risks associated with the house mouse are Salmonella and leptospirosis; this disease is acquired by eating food and drinking water which are contaminated with infected rat urine. can cause damage to structures through their gnawing and eating.